Well, there are tons of elements that come together to make a successful product page. These include price, product image, product copy, layout, etc. One element in particular, product image size, seems to affect the value perception of the product. In this study from CXL Institute (part one of three of a full eCommerce product page study, the others to come soon), we look at product page design, and in particular, how you can increase the value perception of your particular product. 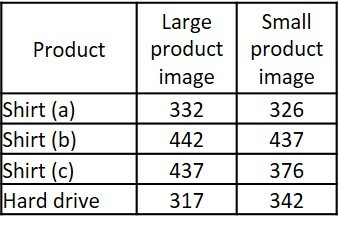 The average perceived value for the large image of the hard drive (search good) was $13.50 more than the smaller image. The average perceived value of the shirt (experience good) was $1 less when the image was larger. 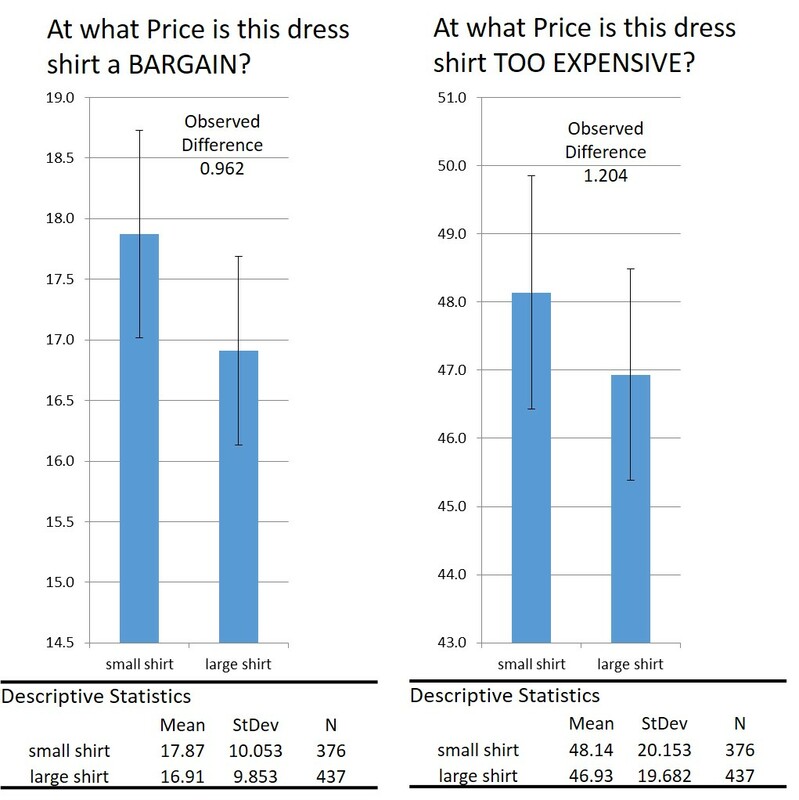 In other words, participants perceived the shirt to be higher quality/more valuable when the product image was smaller and there was more white space on the product page. If you sell a spec-heavy search good (e.g. a hard drive, printer, camera, etc. ), test a larger image on your product page. If you sell a design-heavy experience product (e.g. a shirt or some other wearable), test more white space on your page (to minimize visual complexity). In our tests, all 3 website variations with more white space resulted in higher perceived value (due to image size and other web elements). We test these hypotheses across product ‘classes.’ The product classes we use vary according to the commonly used ‘experience–search’ product classification, an economic theory developed by Philip Nelson. We use a men’s dress shirt as an ‘experience’ product, an external hard drive as a ‘search’ product, and a pair of over-ear headphones as a hybrid. Product type can also be characterized by a ‘design-spec’ range as well. The idea behind this range is that some products’ value are derived from their overall design (the shirt) while other products are defined by their specs (the hard drive). The headphones represent a hybrid product since both design and specs contribute to their value. Does Image Size Affect Value Perception? Hypothesis: Large product images on product pages result in a higher perceived value compared to smaller product images on the same page. In other words, people will perceive a product to be more expensive/valuable when its display picture is large. We also wanted to understand if this effect was more pronounced in different product categories. So we tested a product from each end of the spectrum, from “experience goods” (products that are hard to evaluate before consuming/using them) to “search goods” (products with features that are easy to evaluate before consumption). The study treatments included a dress shirt product page and a hard drive product page. The dress shirt test had unexpected results, opposite our hypothesis, so just to add some validity we replicated the test on two additional websites, varying in design characteristics and price point. The dress shirt represents an experience good while the hard drive represents a search good. For the dress shirt, product image and brand logo remained consistent across all three treatments and acted as control variables. The size of the product image acted as the treatment variable and varied across the three websites. Any prices and indications of price were removed from the pages. These questions are a modified version of the Van Westendorp Price Sensitivity Meter. Variation one: This website was the original source, except we either enlarged or reduced the shirt image size for the treatment variations. The original price of this shirt was $145. Shirt (a) Results: What’s the Takeaway? The smaller image actually produced a higher perceived value, significantly so for the ‘bargain’ question in a t-test (p-value = 0.012) and nearly so for the ‘too expensive’ question (p-value = 0.117). It’s likely that with additional responses, the ‘too expensive’ question would’ve produced significant results as well. 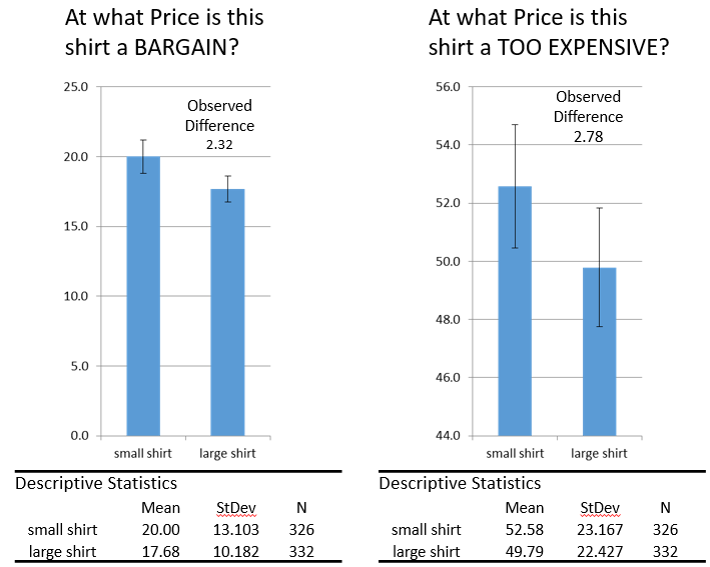 As of now for this ‘too expensive’ question, there’s 94.1% certainty that the smaller shirt image has a higher perceived value (smaller shirt mean > larger shirt, p-value = 0.0587). Not only does this make us reject our hypothesis, it flips it. We now have evidence that a smaller image can not just change but increase value perception (at least for a men’s dress shirt, a clear ‘experience’ product). An alternative hypothesis that we now want to test is whether the effects of simplicity and more whitespace increase value perception more than a large product image can. This is why we tested the two additional shirt variations below, both had ‘busier’ displays. Variation two: Here we’ve modified a Macy’s product page which is generally a busier design (e.g. core colors, text, elements, etc.) than variation one. The price of the shirt originally shown on this page was $52.50. There were no significant results between image sizes for either question. However, the pattern of lower value perception for a larger product image exists. Although not significant at the 0.05 level, there’s a 78.5% chance that the means between the small and large product images are different for the ‘bargain’ question. Variation three: The last variation is a modified version of an Amtify shirt product page. The price of the shirt originally shown on this page was $29.90. Again, there were no significant results among the image sizes for either question. However, the pattern of reduced value perception for a larger product image does exist. However, this one is closer to significance than the Macy’s variation. There’s an 83% chance that the ‘bargain’ question resulted in different means between the image sizes, and a 91.5% chance that the small image mean is greater than the large image. This result shows a stronger pattern compared to the Macy’s variation. This product page is visually less complex than the Macy’s page, which is a theory on why this result is stronger than the Macy’s variation but weaker than variation one’s simple design. So, what about search goods? We modified the product page here. Remember, our hypothesis was that the larger image would translate to a higher perceived value and that the ‘experience’ type of product (shirt) would show a larger difference among image sizes compared with the ‘search’ type of product (hard drive). This ‘search’ or ‘spec’ product category confirms our hypothesis that a larger product image will increase value perception. And it did so with pretty large numbers, especially compared to the shirt variations. 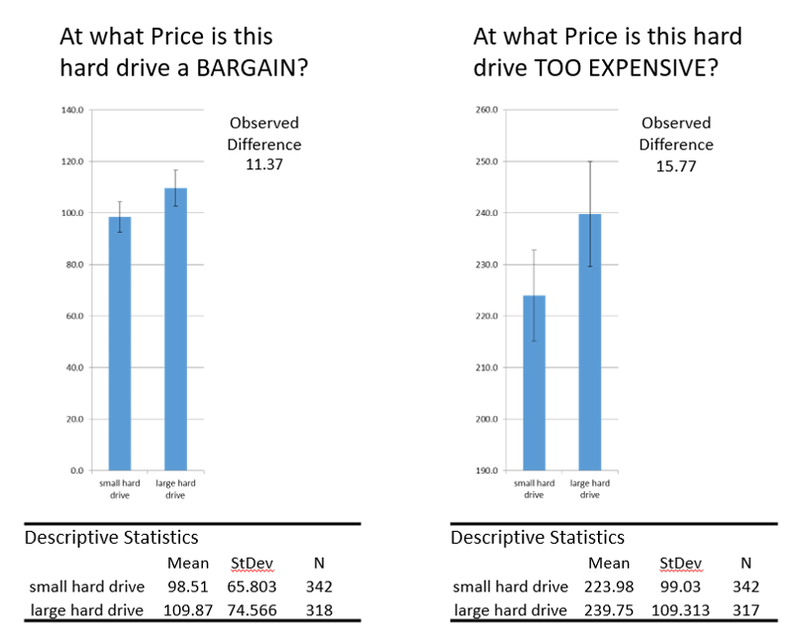 When asked “at what price is this hard drive a bargain?” respondents perceived the product page containing the larger image to be 11$ more valuable than the hard drive product page with the smaller image. When asked “at what price is this hard drive too expensive?” respondents were willing to pay $15 more for the hard drive with the larger product image. 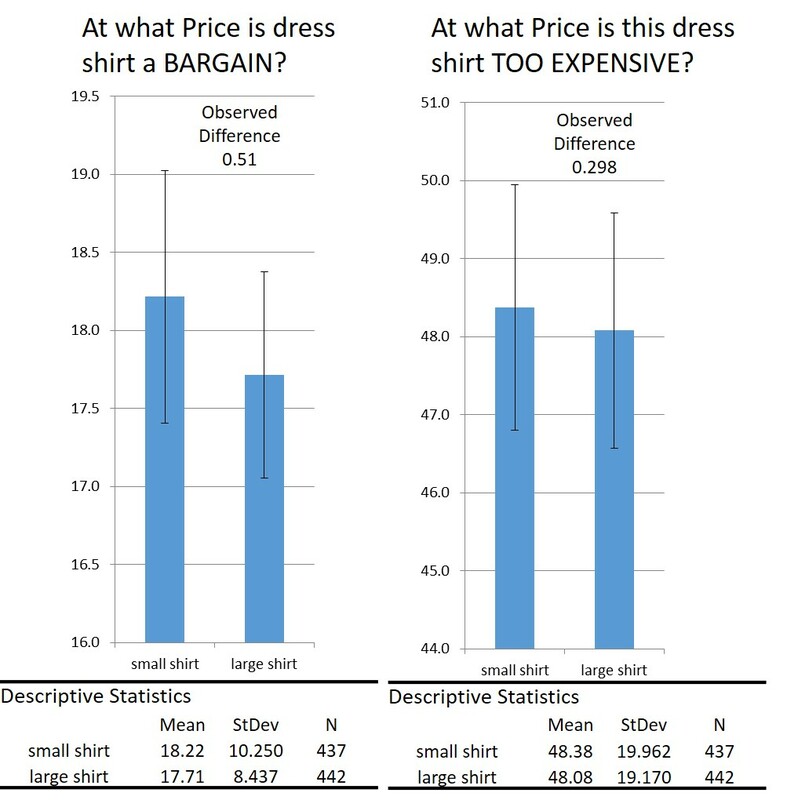 The difference between perceived value in the ‘bargain’ question was significant (p-value = 0.039), and the difference in the ‘expensive’ question was nearly so (p-value = 0.053). Pretty strong results here. We thought that larger images for experience goods (like shirts) would be viewed as more expensive/valuable. However, it was the opposite. People viewed experience goods as less valuable (generally) when larger images were used. However, it was the converse for search goods (like hard drives). Larger images made people perceive the products as being more expensive/valuable. Note: this is a 3-part series on e-commerce products. Make sure to check out study 2 and study 3 as they come out in the next week or two. Click here to suggest our next research study. I’d be interested to see if these results were the same for women; whilst I understand women buy hard drives, I’m guessing more males purchase them than females. Women tend to be better at filtering visual distraction so the results could be very different. Good point Gideon, our survey didn’t ask questions about gender…but we should have! We might go back and revisit the survey to send it out again with this in mind, so stay tuned for updates. I also wonder if the shirt website looks ugly with the larger image. From the pictures, I think the image looks disproportional to what you would normally expect and that may explain why the price perception difference. With regard to the hard drive, I feel the design of the webpage itself is not good and therefore, a larger image doesn’t make the page look as ugly. But also compare the small image of the hard disk to the page – there is so much of white space around the small hard disk image that it makes the webpage look weird. To really compare apples with apples, it might have better to use the same webpage to sell both items – that would have reduced one of the variables. Hey Ajit, all good points. What provides me some level of certainty on the ‘pattern’ with regards to the shirt was it was seen across all sites…and generally we do come across sites with varying levels of ‘space’ around product images. Cheers, and thanks for the comments! I would also like to know the effect on light boxes? In theory they too should be optimised price perception in mind? One quick question: where on your scale would you place digital goods such as software? As for the shirt, the fabric quality is a very important factor, and from the looks of it the bigger picture shows off it’s crappy fabric. Would it have been possible to compare an experience description vs search description for the same product? For example, when researchers investigate utilitarian vs. hedonic goods, they’ll often use the same product (e.g., blender), while varying the types of benefits, such as utilitarian (e.g., cheap price, easy-to-use) or hedonic (e.g., make delicious cocktails). With the same product, it’s a little more valid control. I agree with one of the other comments. I think the results were due to processing fluency. With shirts, size is neither beneficial nor harmful. With hard drives, however, size IS beneficial. People want LARGER storage. Even though the physical size is irrelevant to storage size, it doesn’t matter. Due to the underpinnings of fluency, people will misattribute the physical size to the metaphorical size of storage. If that explanation is true, it might be interesting to test image sizes in domains where size — metaphorical or physical — is beneficial. I have a hunch that larger product images will perform better. In cases where size is negative (e.g., travel sized products, a medicinal pill you have to swallow, etc. ), smaller images would probably perform better. Yo Nick, all good comments. We’ll have to test the description on the same product idea…maybe across experience-search-credence good types? Good idea, but it is definitely a separate question from what we were asking. You mean perceptual fluency? Though I haven’t thought about these concepts in a while. And I agree with you that size of hard drive is important, but that was the hypothesis, we wanted to get data behind it. Though I’ll also say that people tend to want and pay more for smaller hard drives….though maybe that doesn’t jive with perception (which is interesting to think about). To me, the key is the shirt finding generally, and the DATA for the hard drive finding, meaning that it is intuitive but also good to have some data behind it to start up conversations like these and get other test ideas! You’ll soon see more and more studies come out like this, and like all experiments, result takeaway extrapolation outside of the specific study design is dangerous. What’s good is the advancement in thinking around the idea, and new hypotheses and test ideas generated. This is interesting and all but how did the image sizes affect ROI? What people say and what people actually do are two very different things. Electronics and apparel are good examples. How about for the home / organization type solutions like garment racks/folding drying tables/cloth closets/shoe racks/hangers in the under $50 price range. Does image size impact things? I’m wondering why you chose a shirt with a pattern which some people (myself included) would consider to be an unattractive shirt — magnify a pattern which a person thinks is unattractive and it likely becomes more unattractive. Would a plain white shirt have had the same results? My point was that a white shirt would not be any uglier when enlarged, but a shirt with a pattern you didn’t like would be uglier enlarged. Would that not affect the results? So your argument is that a white shirt is more universally liked than a simple pattern shirt? I’d think that people not liking the pattern in the shirt would be a minority…it’s a pretty vanilla pattern, and as mentioned, controlled for. Then the effect you’re talking about is that there’s an INCREASE in ‘not-liking’ due to image size….likely a minority within the minority. And considering the number of people survyed (600+), I’d think that it wouldn’t be a confounding variable. The white shirt would have the same potential issue as some people don’t like white shirts right? Maybe less so, but nevertheless I don’t think this is a big issue here. Might be worth testing though! ‘Experience’-type products will always have this problem I think. Thank you for such a great research. I have never thought of what you’ve done. Once again thanks so much to Michael and, you Ben for the nice conversation.